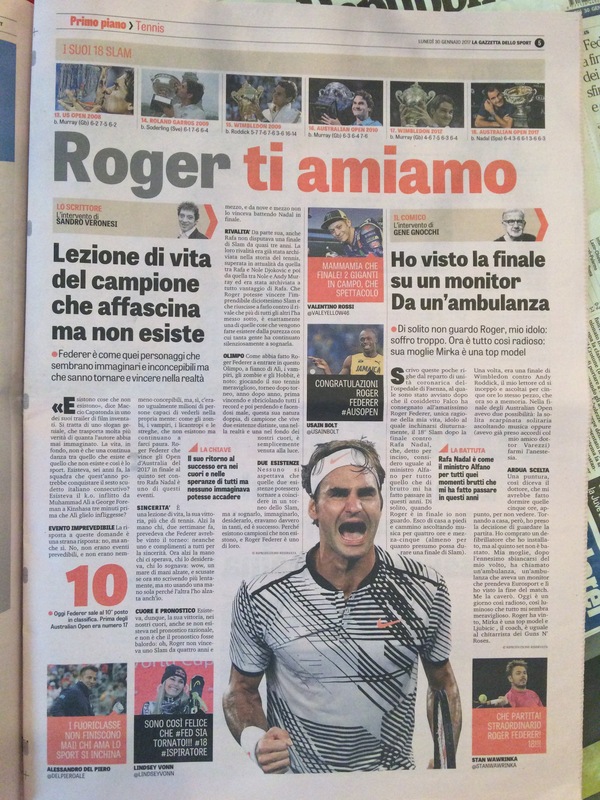 Roger Federer: semplicemente grazie .!. 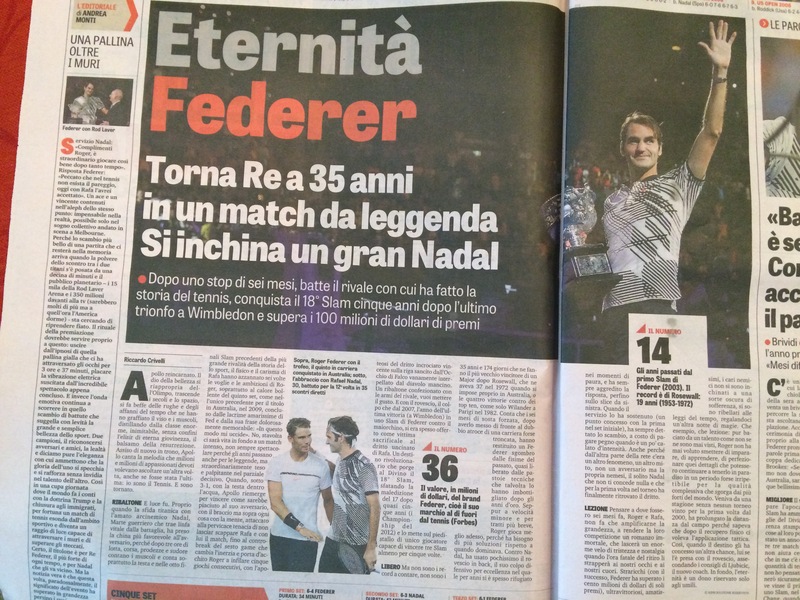 Domenica 29 Gennaio, quando in Italia erano da poco passate le 13 e a Melbourne le 23, Federer ha scritto un’altra pagina della sua già grande storia. Probabilmente la pagina più emozionante e commovente, non solo per noi che lo seguiamo sempre con grande affetto, ma anche per lui… Lo confermano le lacrime, stavolta di gioia pura e un anche un po’ inaspettata. 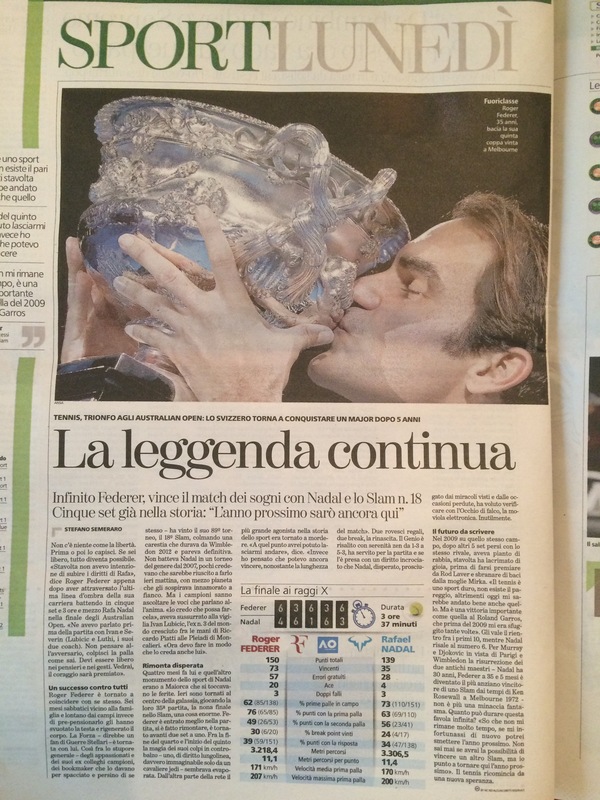 Conquistare, a trentacinque anni e qualche mese, il tanto agognato diciottesimo slam, battendo il rivale di sempre, Rafa Nadal, come non era mai riuscito a fare, cioè recuperando un break nel quinto set, non può lasciare indifferente nessuno. 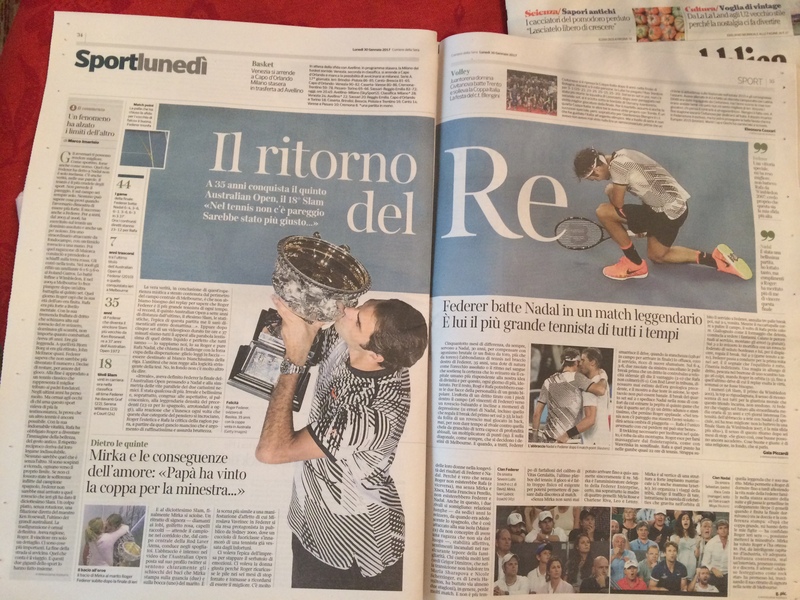 Nemmeno un grande campione. Chi mi conosce bene, sa la gioia che ho provato in quei momenti, e che sto ancora provando. 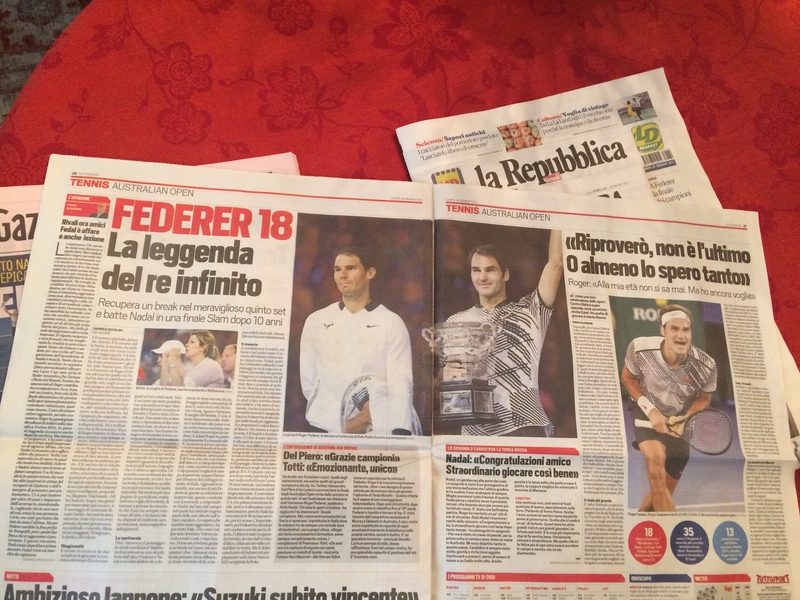 Grande è stata l’impresa compiuta da Federer: ho pianto anch’io e stavolta sono state lacrime di felicità e non più di delusione, come è successo tante volte, purtroppo, negli ultimi anni. Voglio ricordare le più recenti, per giustificare la gioia provata, difficilmente misurabile con aggettivi: la finale di Wimbledon 2014, le semifinali degli US Open 2014 e Wimbledon 2016 e l’annuncio dello stop forzato per sei mesi. Immaginando quello che ha significato per me il risultato di domenica e le emozioni che ho provato (“tu chiamale se vuoi emozioni” per usare le parole di Battisti), alcuni abituali lettori dei miei pezzi hanno giustamente atteso che io scrivessi qualcosa. Conscio che tanto è già stato detto e del rischio di scadere nella retorica, sono stato molto in dubbio se farlo a meno. 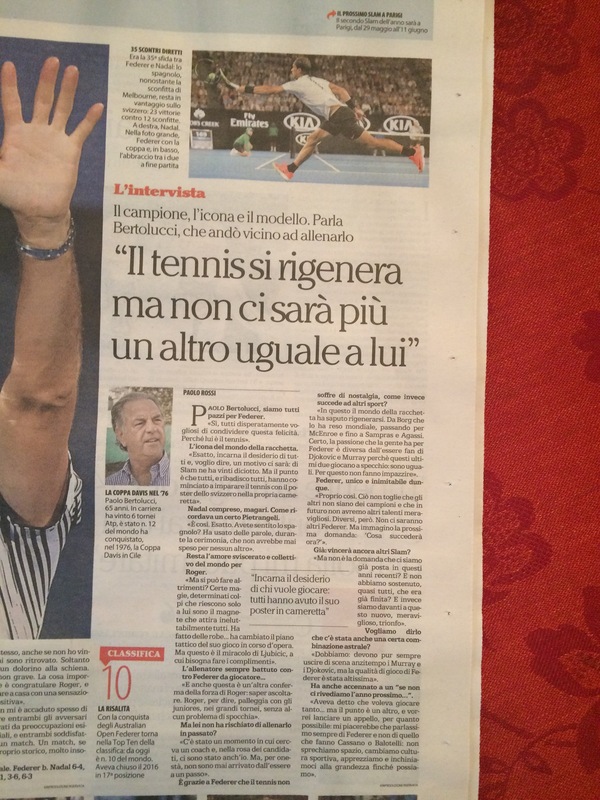 Molte voci autorevoli hanno riempito i giornali nei primi giorni di questa settimana, e non solo le testate sportive. 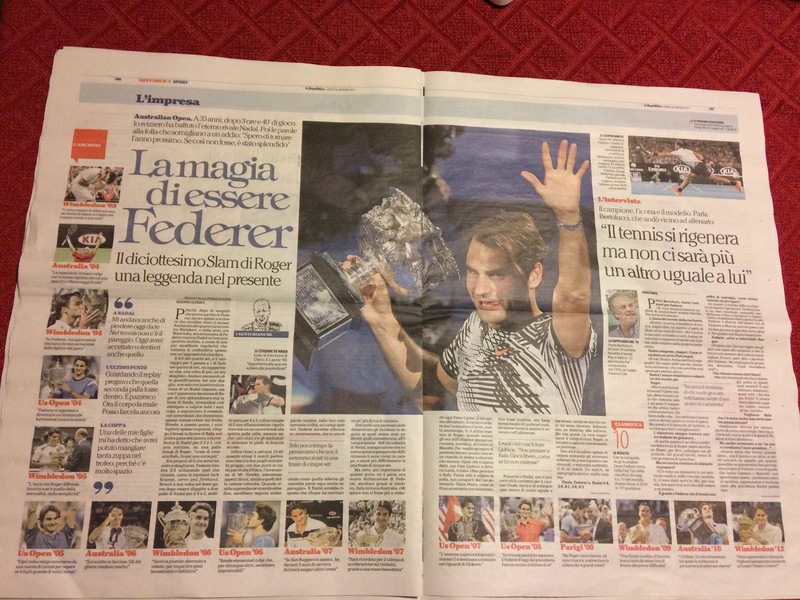 Il campione è stato analizzato a 360°: come tennista, come avversario, come marito, padre, figlio… Cosa potrei io aggiungere? Ho, quindi, pensato fosse più utile (e anche più tranquillo per me!) creare un collage delle frasi più emozionanti comparse negli articoli di alcuni quotidiani. Un puzzle che non sarà completo in ogni sua parte ( mi limito a riportarvi ciò che ho letto sulla carta stampata che ho recuperato svaligiando l’edicola del mio paese), ma che penso sia più che sufficiente a creare una bella immagine del nostro campione. 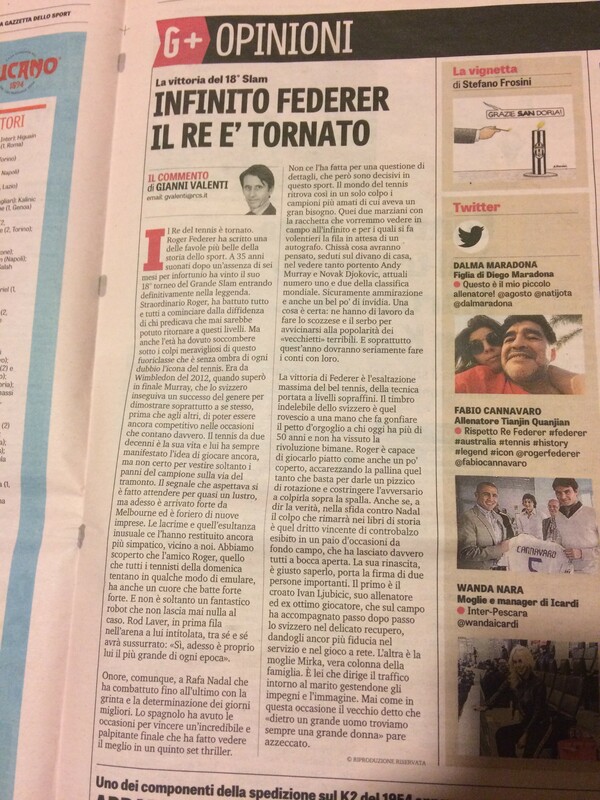 Ho dato il via al puzzle di Federer vincitore…… Se chi mi legge ha articoli interessanti, apparsi su altra carta stampata o sul web, non esiti a riportarli o darne indicazione come commento a questo pezzo. Grazie! I together with my pals came digesting the best techniques from your site and before long developed a terrible suspicion I never thanked the blog owner for those techniques. All the women are actually totally warmed to study all of them and have pretty much been tapping into those things. We appreciate you genuinely very considerate and then for settling on this form of tremendous things millions of individuals are really desperate to learn about. Our own sincere regret for not saying thanks to you earlier. My husband and i have been now joyous Louis managed to round up his reports by way of the ideas he got from your weblog. It is now and again perplexing just to possibly be giving out ideas which men and women might have been trying to sell. And we all recognize we now have the writer to appreciate for that. Most of the explanations you made, the straightforward website navigation, the relationships you aid to instill – it’s got most sensational, and it’s helping our son and us reason why the concept is excellent, which is certainly particularly important. Many thanks for all! My spouse and i have been really cheerful Peter managed to round up his research because of the precious recommendations he acquired from your web page. It’s not at all simplistic to simply choose to be releasing key points which often men and women might have been making money from. And now we realize we’ve got the website owner to give thanks to because of that. Most of the illustrations you’ve made, the simple website menu, the relationships your site help create – it’s mostly astounding, and it’s really aiding our son and the family recognize that the concept is cool, which is certainly really indispensable. Thank you for all the pieces! I must show my appreciation for your kindness supporting men and women that absolutely need assistance with this one content. Your special dedication to passing the message up and down came to be exceptionally beneficial and has specifically empowered associates much like me to get to their endeavors. Your own valuable information signifies so much a person like me and still more to my office workers. Thanks a lot; from everyone of us. Thanks for all your efforts on this website. Gloria enjoys making time for investigation and it’s really obvious why. We all learn all of the lively medium you make helpful steps through your website and even invigorate contribution from other people about this content then our own girl is in fact studying a great deal. Take advantage of the remaining portion of the year. You’re the one conducting a dazzling job. A lot of thanks for all of your efforts on this blog. Betty delights in conducting internet research and it is simple to grasp why. We hear all of the powerful means you create rewarding steps by means of your blog and invigorate response from other people on this article while our favorite child is now studying a lot. Enjoy the remaining portion of the new year. You are always performing a fabulous job. I wanted to write a simple note to be able to appreciate you for some of the fabulous points you are showing on this site. My extensive internet investigation has finally been recognized with wonderful details to exchange with my family and friends. I would express that most of us visitors are really lucky to be in a fine website with so many brilliant professionals with helpful secrets. I feel extremely privileged to have encountered your entire site and look forward to many more fabulous minutes reading here. Thanks once more for everything. I would like to express my appreciation to the writer for bailing me out of this particular instance. Right after looking out throughout the the net and getting ideas which are not helpful, I was thinking my life was done. Being alive without the presence of solutions to the difficulties you have resolved as a result of this website is a serious case, as well as those which could have in a wrong way damaged my entire career if I hadn’t noticed your web site. Your understanding and kindness in handling all things was useful. I don’t know what I would have done if I had not come across such a subject like this. I am able to at this point look ahead to my future. Thanks a lot very much for this expert and results-oriented help. I will not hesitate to suggest your blog to any individual who will need care about this situation. I simply wanted to appreciate you all over again. I am not sure the things I could possibly have sorted out in the absence of the type of suggestions revealed by you concerning such problem. It was an absolute horrifying situation in my circumstances, however , being able to see the well-written form you treated it took me to leap with fulfillment. I will be thankful for the work as well as pray you recognize what an amazing job that you are getting into training men and women via a blog. More than likely you have never come across all of us. I am glad for commenting to make you understand what a great discovery my princess encountered checking yuor web blog. She discovered a good number of pieces, with the inclusion of what it is like to possess an ideal coaching heart to have a number of people easily grasp certain complicated subject areas. You undoubtedly exceeded people’s expectations. Many thanks for distributing the useful, healthy, informative and also easy tips on this topic to Jane. L’unico modo in cui gli altri tennisti oggi al top possono battere il Federer che abbiamo visto in campo nella finale del singolare maschile a Wimbledon contro Andy Roddick, sarebbe quello di coalizzarsi contro di lui tre-contro-uno, ma non credo che le regole consentano questo tipo di competizioni. I am often to blogging and i really appreciate your content. The article has actually peaks my interest. I am going to bookmark your site and maintain checking for brand new information.